Hundreds of years ago, scientists and explorers believed that the needle of a compass pointed north because it aimed itself towards the “Rupes Nigra”, a mythical 33-mile wide black rock that was located between four polar islands and carried an extreme level of magnetism. 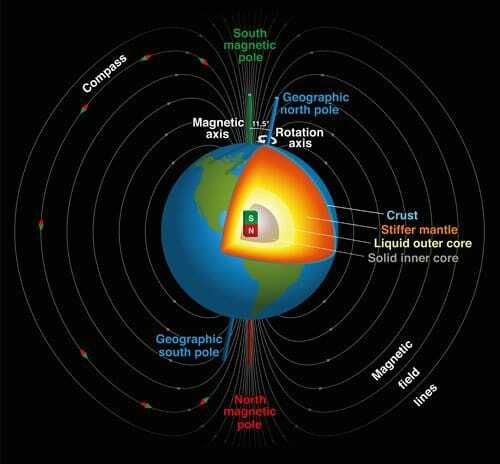 Today, however, we know that polar magnetic north does not come from a simple cluster of magnetic materials, but from the convection and balance of metals in the Earth’s core. In addition, a single island could not account for magnetic forces because the Magnetic North Pole is constantly moving. 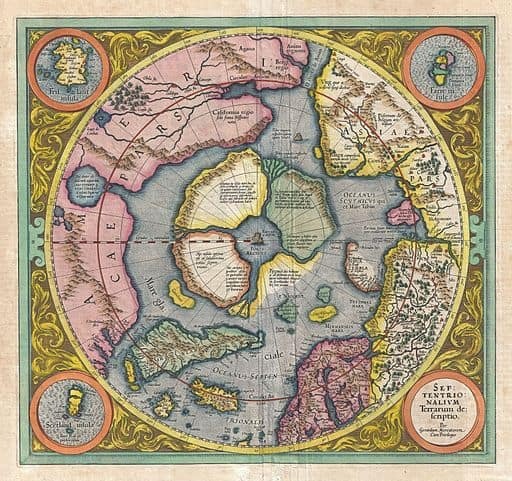 Gerardus Mercator’s map of Rupes Nigra in the North Pole from 1595. The outer core of the Earth is composed primarily of molten iron, nickel, and other metals, which, from reacting with even hotter and more-pressurized solid iron in the inner core, cause a constant internal convection in the planet. This hot flowing metallic liquid generates electric currents that create magnetic fields. The rotation of the Earth through the Coriolis Effect aligns the smaller magnetic fields generated from convection into one, resulting in the Earth’s geomagnetic field. The geographic North Pole and South Pole are the places on which we imagine the Earth’s axis to spin, and they should not be confused with the Earth’s magnetic poles, which are close to their geographic counterparts, but do not exactly match them. Scientists often explain the Earth’s magnetic field in simple terms as a giant bar magnet inside the Earth that has an 11 degree angle of declination off the axis of the geographic poles, and the ends of this magnet act as the North and South Magnetic Poles, creating the two attracting forces within the magnetosphere. The magnetic poles haven’t been in the same spot throughout the geological history of the Earth. In fact, they move quite often, demonstrating complete magnetic pole reversal about every 200,000 or 300,000 years during the most recent 20 million years. During these times, the magnetosphere has weakened, but it has never completely disappeared. The shifting of the magnetic poles is not instantaneous, and they are constantly wandering in a manner that we have easily observed. 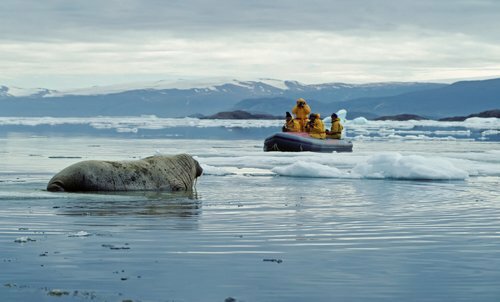 In 1831, James Clark Ross located the Magnetic North Pole location in northern Canada, and Natural Resources Canada tracked it slowly drifting across Canadian Arctic throughout the second half of the Twentieth Century. Currently, the North Pole is traveling through the globe at a rate of 25 miles per year, and is due to drive through the North Sea into Siberia in the next few decades. Photo taken near Ellesmere Island, the location of the Magnetic North Pole in 2001. Immediate effects of the drifting North Pole are currently being felt by some airports, which designate runways from the points of a compass. For example, the west parallel runway at Tampa International Airport, which was formerly named 36Left —18Right to designate compass points of 360 degrees and 180 degrees, is being renamed to 1Left — 19Right to indicate 10 degrees and 190 degrees and ensure secure landing of incoming airplanes. As for when the poles completely reverse, it shouldn’t have a major impact on all forms of life, but it could disturb the migratory patterns of birds. This period is also likely to weaken the magnetic field, which could allow solar flares to damage satellites, something that aerospace technology might need to confront. The geomagnetism of our planet is not so different from the magnetic qualities present in the different metal materials used in manufacturing, construction, and other industries. 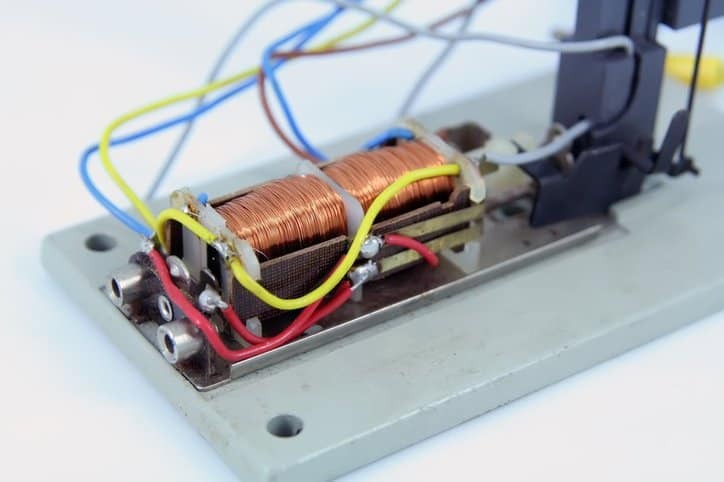 Magnetic particle testing standards provide the appropriate guidelines needed to create materials out of magnetized iron, nickel, and the other metals that are also found in the Earth’s core.